So I need another project like a hole in the head. And this project has so many things wrong with it, but I just love it and can’t let it go. A while ago, a fellow quilter gave me a bag of fabric that she didn’t want, that someone else who didn’t want it had dumped on her. I know someone who uses old fabric to make dog beds, so I took the bag for that purpose, but of course I couldn’t resist looking through it real quick just to see if there was anything I had to have. 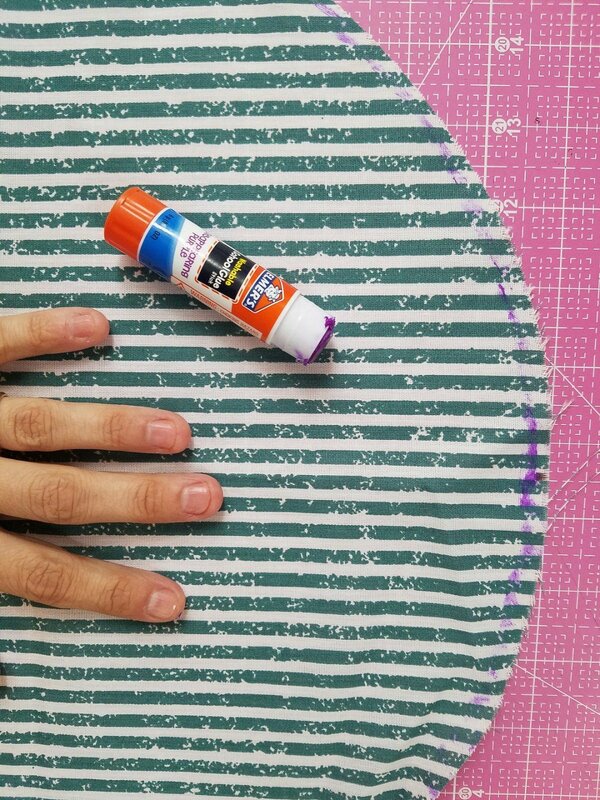 There are a couple of big pieces of old floral yardage from the 90s, and a bit of Shamrock fabric I used to make asking Patrick’s Day scarf for my dinosaur, but the pieces that I couldn’t resist were these ridiculous striped circles. I have no idea what they were initially cut out for – my only guess is placemats? But when I saw them I immediately got the idea to piece them with a white background into a type of drunkard’s path, and could not get it out of my head. 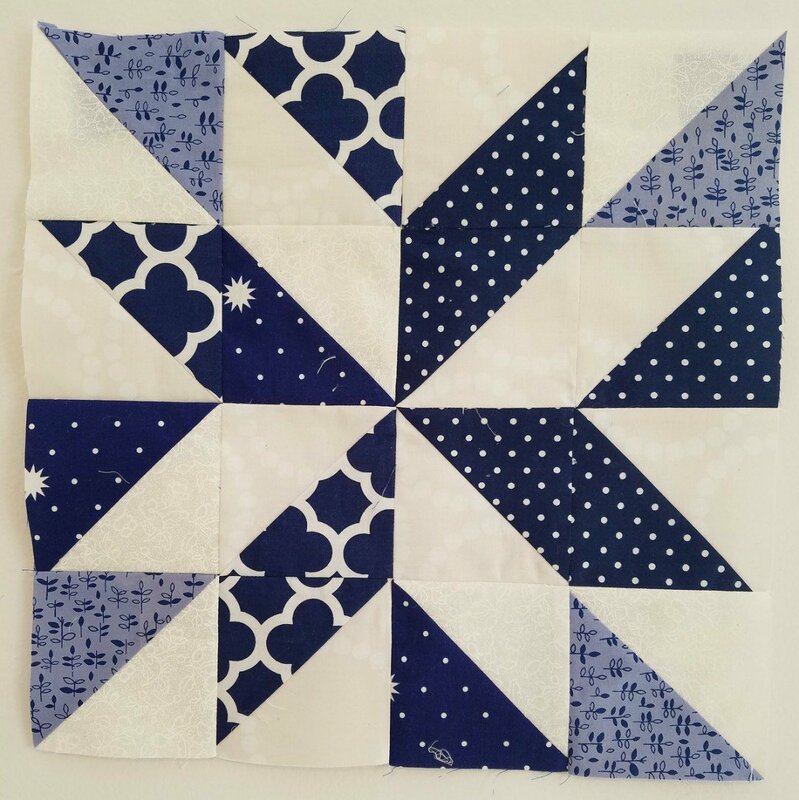 The nice thing about this quilt is it only has 16 blocks – so it didn’t take forever to piece – though when you are doing half a block here and half a block there, because the kids keep interrupting, it takes a little bit longer. 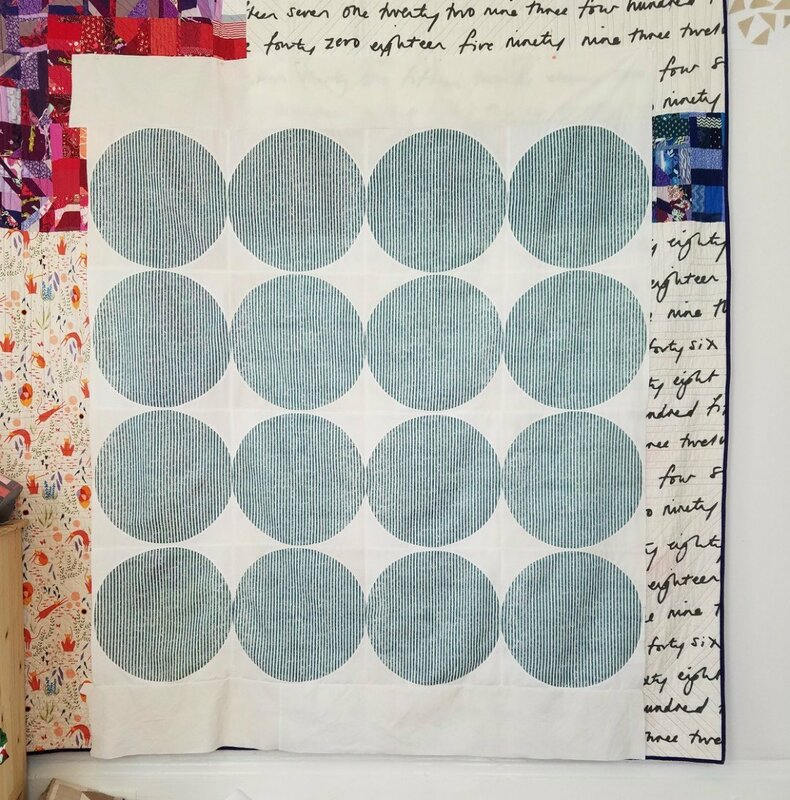 Plus having such large blocks is a challenge in itself – both for cutting accurately and for working with the large bias circles without distorting the fabric during the sewing. 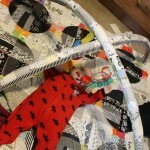 I ended up using a glue stick to hold everything in place while I pieced the circles. I used EQ7 to make a giant drunkard’s path template which I printed out. The blocks finish at 16 in. 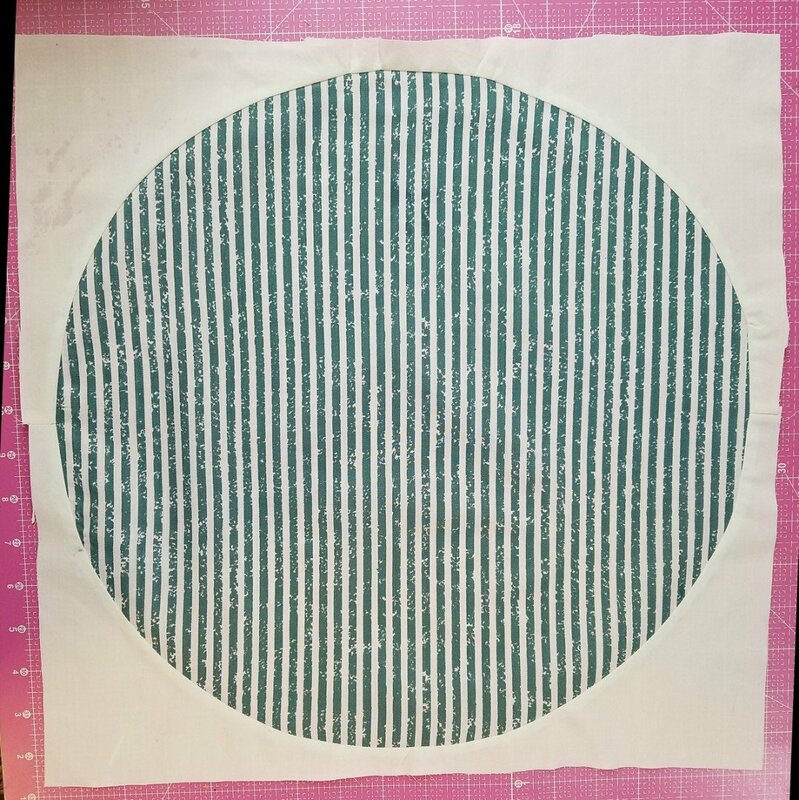 I kept the circles as one unit and pieced the white backgrounds in two units. 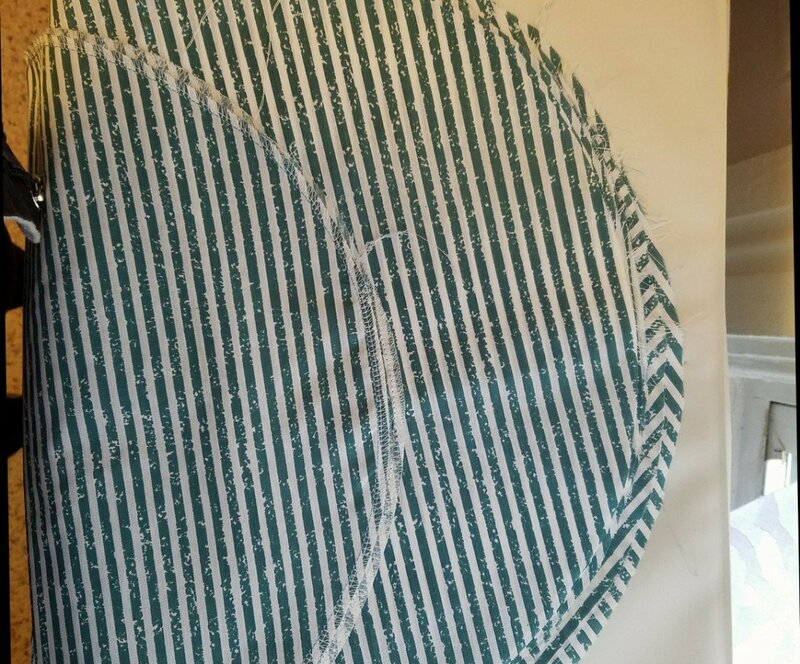 Then I attached the white backgrounds to the block to the circle as one piece. The white background is an old stained sheet I had used in the yard that I had been about to throw away -I don’t even know how it ended up in the house. 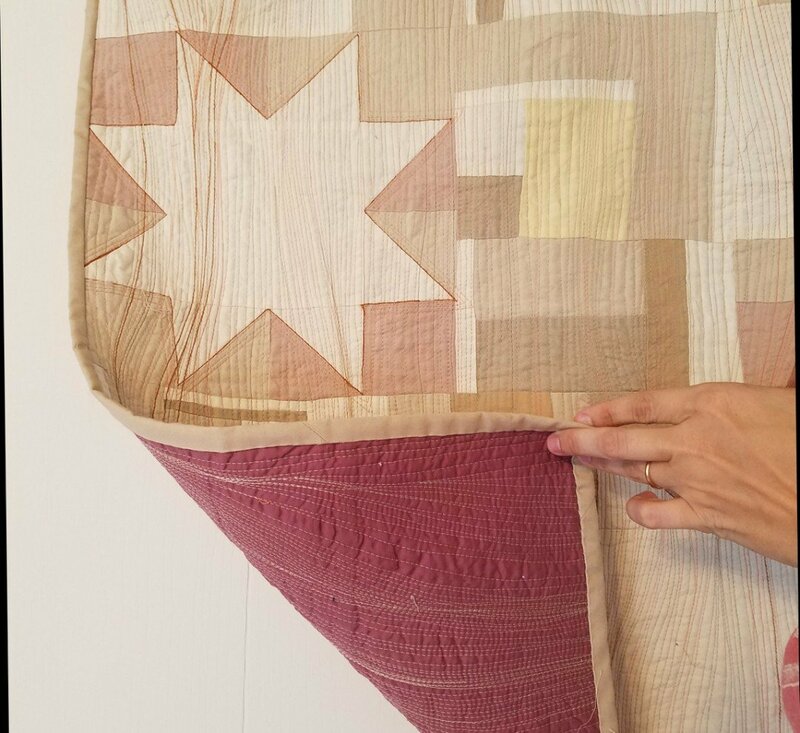 For some reason I thought that the different stain colors would add an interesting texture into the quilt. First I soaked the sheets in bleach and then OxiClean for a couple days and it got as white as it was ever going to get (not very) and decided that I would go ahead and use it to sew with. Now that I have it all together however I regret not just using a nice piece of plain white fabric! 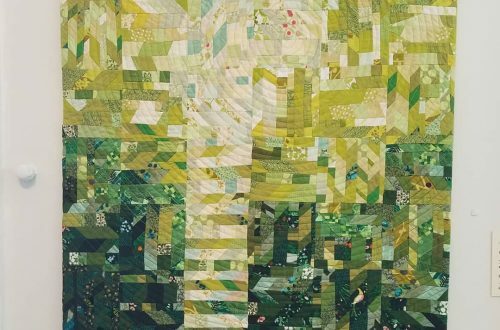 At the time I thought that the stains would create an interesting texture and create a bit of an artistic storyline – with the components being basically trash that I turned into a quilt. 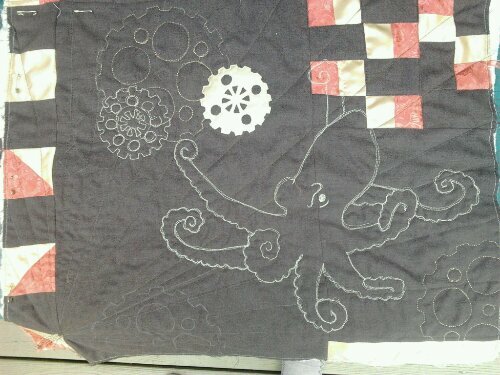 I’m hoping once I have it all quilted it will all come together and be a more subtle effect. It is entirely possible that I am the only one who can see the subtle variations anyway, and I keep reminding myself that the sheet is actually extremely clean as I did soak it for a very long time in bleach. 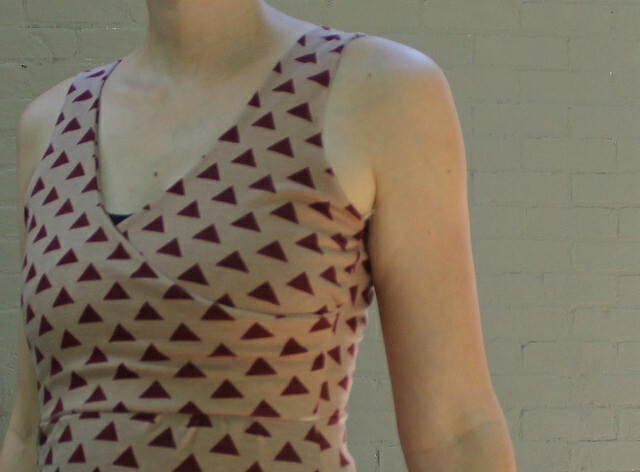 It’s all crazy polyester fabric too – total no-no from the quilt police! 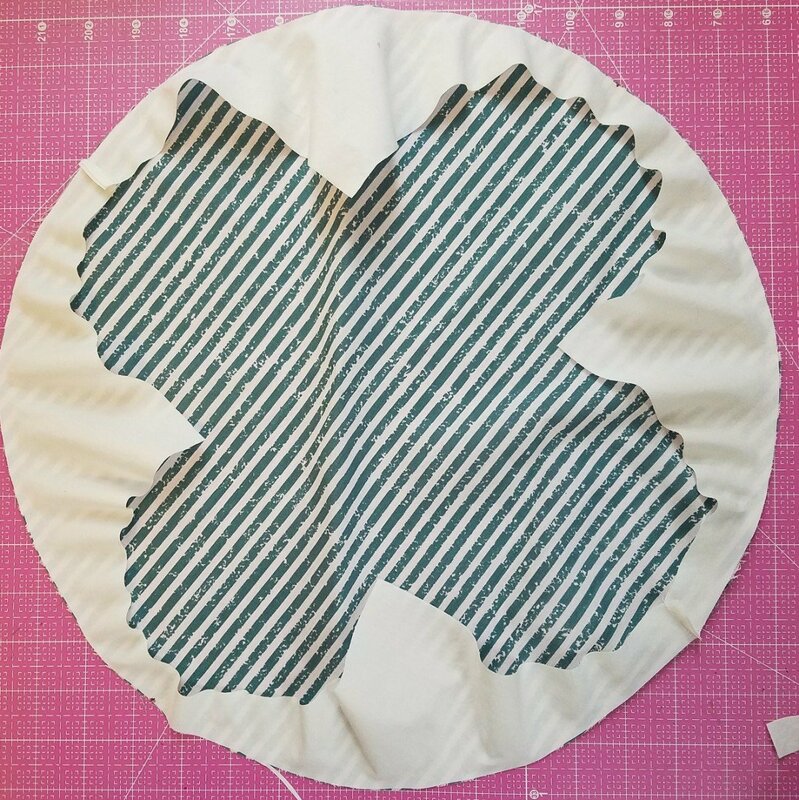 If you are gasping in horror that I am using this dubious quality fabric to sew with – I’m not really expecting this to be an heirloom quilt. It’s just a bit of whimsy that I couldn’t resist doing. For the backing I’m going to use another piece of 90s floral yardage that I got from the initial bag of junk fabric. The batting will be Warm and White which I won as part of Rachel of Stitched in Color Big Bed Quilt A Long. It has been a great motivation for me to get moving on my La Passacaglia – which is a story for another day.